The Jonesville Store, a staple attraction of the Clifton Park and Southern Saratoga County area, has announced the addition of an expansive art gallery featuring multiple artists from around the region. 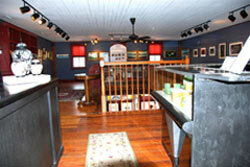 Local.Art.Works is a new venture by John & Jean Travis and Harris & Diane Unger, the owners of the Jonesville Store. Showcasing local artists and featuring new artwork every 6 weeks, they offer a wide range of photography, drawings and paintings in a variety of formats and mediums. Encompassing the entire second floor of the Jonesville Store, it perfectly accentuates the trendy and artistic atmosphere that the store has come to be known for. Accompanying the gallery is the famous Jonesville Store Gourmet Deli. Offering breakfast, lunch and dinner, all food is made using the freshest and finest ingredients by the deli's in-house chefs. You can even get their delicious food catered to your next event! You can also catch live music at the store on Friday and Saturday evenings! Check out our events calendar to see who is playing next!